Heat oven to 350°F. In 10-inch skillet, cook sausage over medium heat, stirring occasionally, until no longer pink; drain. Cool slightly. Stir in roasted peppers, olives, mozzarella cheese and eggs. In medium bowl, mix Cheddar cheese, ricotta cheese and spinach. Unroll phyllo pastry; cover with plastic wrap or towel. 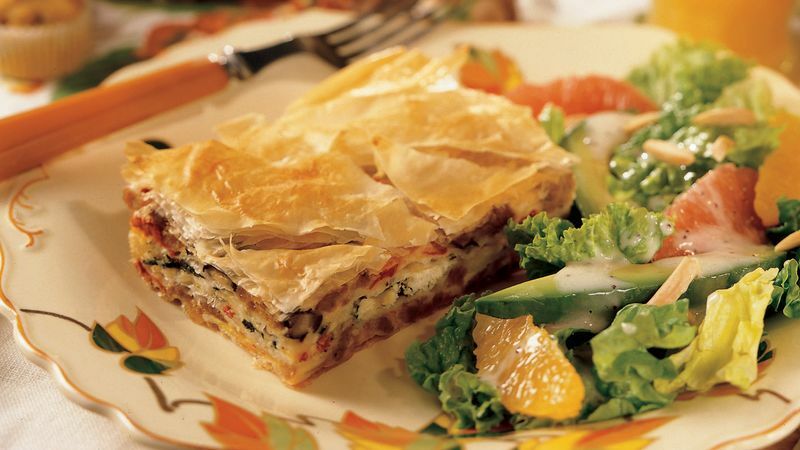 Place 1 sheet of phyllo in ungreased 13x9-inch (3-quart) glass baking dish, folding to fit. Brush lightly with melted butter. Continue layering and brushing with butter 3 more sheets of phyllo. Spoon half of the sausage mixture over phyllo in baking dish. Layer and brush with butter 4 more phyllo sheets. Top with spinach mixture. Layer and brush with butter 4 more phyllo sheets. Top with remaining sausage mixture. Layer and brush with butter remaining 4 phyllo sheets. Score top of phyllo in diamond shapes. Bake 50 to 60 minutes or until puffed and golden brown. Let stand 5 minutes before serving. Make a peppy egg bake using chorizo sausage for the Italian sausage and pepper Jack cheese for the mozzarella and Cheddar.